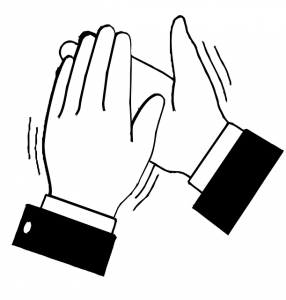 We love to receive applause – especially when it sounds like this! “Wow what a good night. I think you get better, seriously, I thought you were good before but this year was quite different, you engaged with the audience the minute you came in singing. Thank you so much to Barbara for the signing, many people have said how moving it was. They also remarked that the 1st Coldplay was moving too. I am so glad to have heard your voice at last and hear you play, what a treat. Please congratulate the small group performances they were excellent. Do you know that after last year I didn’t think it could get any better but it did. We loved all the ‘extras’, Alan and team back row antics, how much the choir were actually enjoying themselves and the wonderfully clear diction. I couldn’t pick out any one thing I enjoyed the most, although the Coldplay piece always makes me well up and the solo/duets and quartets were very special. 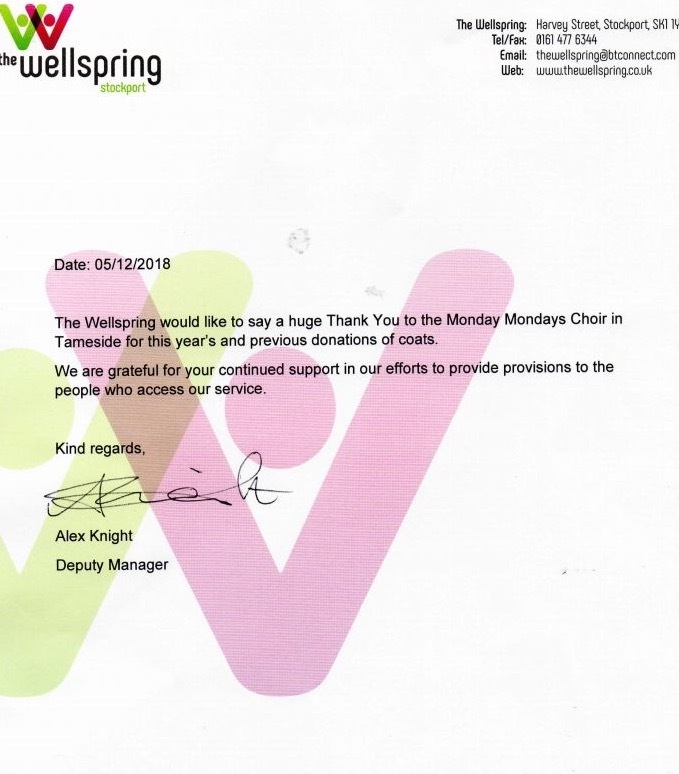 “I had my first sample last night of Monday Mondays acappella choir and it won’t be the last. I’ve always been interested in unaccompanied singing, as the idea that subtle harmonies can make up for backing musical instruments fascinates me. I was not disappointed, for 30-odd men and women to maintain such a sound speaks volumes for both their skill and the effort they’ve put into preparation. Practically all the arranging is done by their highly talented MD, David King. It irritates me that certain people, like him, should be so gifted! Most of the songs were modern, but there was some Elgar and Cole Porter for balance. Plenty of thought had also gone into staging the concert too. There was a quartet and duets accompanied this time by David King! I’d guessed, of course, that 60s stuff by The Beach Boys and Mamas and Papas would feature but I think my own favourite was a fairly recent Coldplay number. It’s almost impossible to establish a favourite amongst such an extensive repertoire but I think my reason for choosing this was that an imaginative way of staging it was used. It was ‘surround sound’ as the choir moved round the outside of the audience so we had an intimate performance of the lovely harmonies. Beautifully balanced and sung with such obvious enjoyment. Saturday night at Spring Bank Arts was a must see (and hear) …. a memorable and enjoyable night …. We will definitely get them back so watch out for them some time next year! 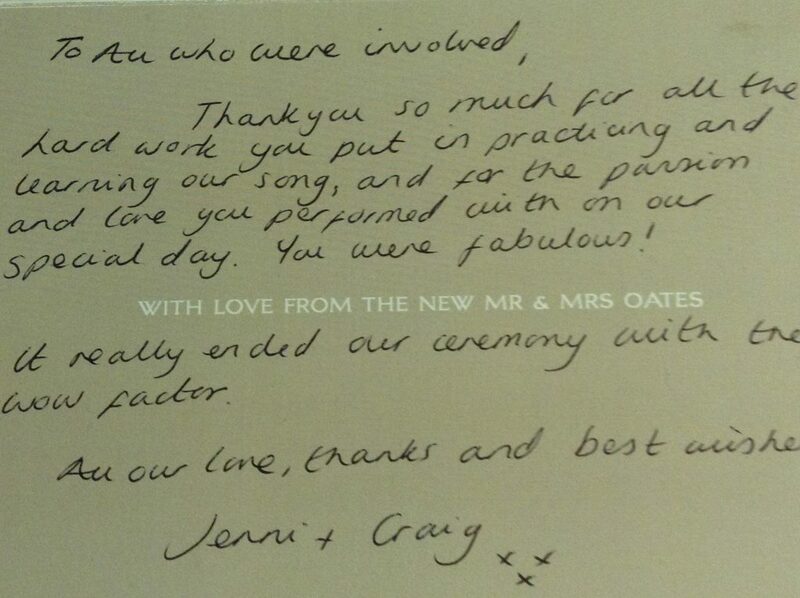 A lovely, personal thank-you from Jenni and Craig Oates. The Mondays were invited to sing at their wedding as a surprise for the groom and guests at Manchester Town Hall on the 9th June 2017. “What a pleasure to hear the Mondays Mondays again. Thanks for another wonderful show, and for helping us to raise over £400 for Re:Dish”. 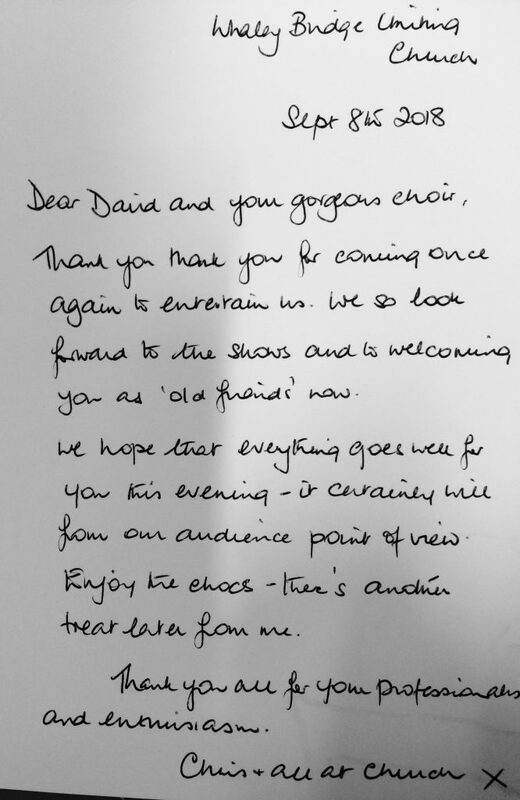 “We thoroughly enjoyed your visit, it was so lovely that the choir got involved with everyone in the interval. Thanks to you all we have £300 to put in the fund-raising pot! We have had so much positive feedback, one woman even posted a mini video on the village Facebook page whilst you were performing saying what a good time she was having! It really is a treat to listen to the choir and watch you perform as you all seem to enjoy it so much, that makes such a difference. I hope you would be willing to come back again some time. “We can’t thank you enough for everything you did for our wedding day, you were all fantastic. Everybody commented on how brilliant you all were”.